The Diocese of Shrewsbury is working with the Most Rev. Vincent Nichols, the Archbishop of Westminster and president of the Catholic Bishops’ Conference of England and Wales, in preparing new catechetical material for the forthcoming Year of Faith. These predominantly include a series of Walk With Me booklets that focus on a weekly theme taken from the Catechism of the Catholic Church and which offer the reader a series of daily meditations. The initiative is in keeping with the intentions of Pope Benedict XVI that the 1992 Catechism of the Catholic Church serves as the major guide in helping Catholics to rediscover the truth of their faith. Accompanying the booklets will be a Preacher’s Guide for the Diocese of Shrewsbury, with catechesis, study questions and liturgical suggestions for every Sunday of the Year of Faith that runs from October (see notes below). • a five-day clergy pilgrimage to the sites of the first four Church Councils of Nicea, Constantinople, Ephesus and Chalcedon. Monsignor Philip Egan, the vicar general and the episcopal vicar for the Department for New Evangelisation, is inviting every parish to provide an outline about how the plan to respond to the Year of Faith. The Year of Faith will run from 11th October – the 50th anniversary of the opening of the Second Vatican Council – and it will conclude on 24th November 2013, the Feast of Christ the King. The Holy Father has said that he hopes the occasion would provide “renewed energy to the mission of the whole Church to lead men and women out of the desert they often are in and toward the place of life – friendship with Christ who gives us fullness of life”. The Pope said he hopes the Year will be a “moment of grace and commitment to an ever fuller conversion to God, to reinforce our faith in him and to proclaim him with joy to the people of our time”. Pope Benedict formally announced the Year of Faith on 17th October 2011 when he issued the apostolic letter Porta Fidei (the Door of Faith). “Faith grows when it is lived as an experience of love received and when it is communicated as an experience of grace and joy,” the Pope wrote. 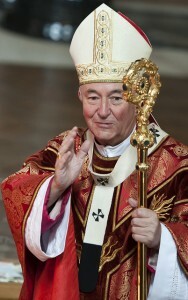 Catholics cannot “grow lazy in the faith”, he added. The Pope explained that the main focus of the Year will be on the person of Jesus Christ because “in him, all the anguish and all the longing of the human heart finds fulfilment”. The Catechism of the Catholic Church, published in 1992, should serve as the major guide for assisting Catholics discover the truths of faith anew and to widen their understanding of Catholic beliefs. A pastoral document from the Congregation for the Doctrine of the Faith is intended to help the faithful live the year “in the most effective and appropriate ways at the service of belief and evangelisation”. Besides greater study and prayer, the Year of Faith also must be accompanied with more acts of charity. “What the world is in particular need of today is the credible witness of people enlightened in mind and heart by the word of the Lord, and capable of opening the hearts and minds of many to the desire for God and for true life, life without end,” the Holy Father wrote in the Apostolic Letter. The New Evangelisation is addressed primarily to people who have drifted from the Church in traditionally Christian countries. The Pope has placed the New Evangelisation at the top of his agenda by making it the subject of the XIII Ordinary General Assembly of the Synod of Bishops from 7-28 October 2012, during which the Year of Faith will be opened. Underpinning the New Evangelisation is the reality of the Church’s enduring mission and responsibility to evangelise by proclaiming the Gospel of Jesus Christ. According to Blessed Pope John Paul II, the New Evangelisation must be new principally in its ardour, methods and expression, thereby presenting itself as an appropriate, timely tool in addressing the challenges of a rapidly changing world. Among those challenges facing the Church in England and Wales is the evangelisation of a profoundly secular culture which is losing the capacity to understand the Gospel as a living and salvific message. Although anti-Christian, anti-religious and anti-clerical messages are sometimes heard today, secularism in recent times has not take the form of a direct outright denial of God, religion and Christianity. Instead the secularising movement has taken a more subtle approach in cultural forms which invade people’s everyday lives and foster a mentality in which God is completely or partially left out of life and human consciousness. Excesses of secularism are now faced almost each day in various manifestations of the “dictatorship of relativism”. The New Evangelisation will provide the impetus for weary and worn-out Christian churches to rediscover the joy of Christian experience, the knowledge of the love of God and the clear understanding of the meaning of freedom in the search for truth.